Suzane Herget has been interested in miniatures since a young age and has subsequently hand made miniature accessories for her daughters dolls house. In 1981, Suzanne was taught how to hand make Tatting and in 2007 she applied for and was awarded IGMA status. 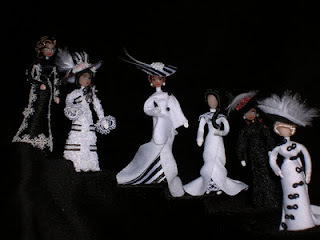 Around 2008, having moved to quarter scale, Suzane started to move into the area of doll making and made a series of dolls for an Anniversary Inn. Her Eliza Doolittle and friends seen above were some of her first creations and continue to be among her favorites. On Suzane's blog, you will find her beautifully made dresses and petite count embroidery. Suzane tells me she loves to create and is always happy to consider special orders. 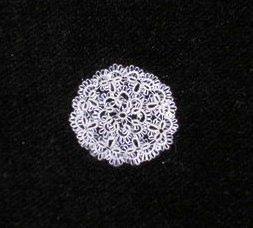 Throughout the month of November, Suzanne is offering a tiny, round doilie for sale. This doilie measures less than 1" across and is being offered for sale to worldwide customers.